Florida Attorney General Pam Bondi does not want to be bullied by Hillary Clinton. She likes it much better when she’s bribed. For months we’ve heard about the corruptness of The Clinton Foundation. The foundation is a charity. It focuses on global health, climate change, improving opportunities for girls and women and a variety of other activities. You know. Good stuff. Though there’s been accusations of pay-to-play with the foundation, all investigators can find are contributors seeking meetings with world leaders. That’s about it. 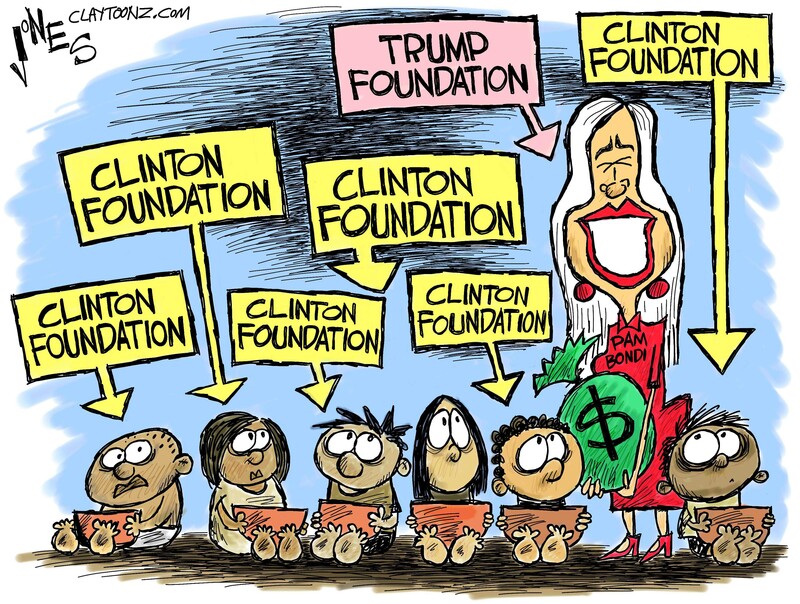 Now we have the Trump Foundation. This is also a charity. Supposedly. Donald Trump established it and other people put money into it. Donald Trump does not. Who benefits from the Trump Foundation? Starving children? Aids victims? People with small hands and funky hair? We’re not sure except that public office holders threatening to investigate a Trump business will get a payout. You may ask “isn’t that illegal?”. Using a charity to make a political contribution? It sure sounds illegal. It is. How would you feel if the quarters you gave a Salvation Army Santa was spent on a 40? Trump University was scamming people in Florida. Pam Bondi looks into opening an investigation on Trump University. She also asks Donald Trump for a political contribution. Trump’s charity gives $25,000 to a pac supporting her. And surprise! Days later she drops all interests in an investigation of Trump U. She later receives a swanky fundraiser at Trump’s Mar-A-Lago resort in Florida and more donations from Melania Trump. How could a Trump initiative make such a HUGE mistake when Trump always hires the best people? He’s shrugged his shoulders blowing it of as a mistake, but he’s also claimed during the Republican debates that when he gives politicians money that they do what he wants. Hey, Pamela. Did you do what he wanted? Did he want it nasty? Of these two foundations, which of their law breaking have you heard more about? The bar is set seriously low for Trump. It comes down to this: Clinton’s foundation has been accused. Trump’s foundation has been found guilty of breaking the law by the Internal Freaking Revenue Service of taking money intended by donors to help the needy but instead given to a political candidate so she doesn’t investigate a Trump business shadier than the Plexus diet drink pyramid scheme. Now which one of these is corrupt?